Reed warblers have an unstreaked brown back with a light buff underside. They have a round head with the forehead flattened, a long slim pointed bill, a narrow faint supercilium not extending behind the eye, and a white throat (cf. sedge warbler which has a broad, pale supercilium). The legs are dark brown or greyish and it has a long powerful tail which is unusually square, usually slightly rounded. Ages and sexes are similar in appearance. It is very similar to other, rarer, warblers and is best distinguished by its song (see Reed Warbler & its Song) which is a slow, chattering jit-jit-jit with whistles and mimicry added (cf. sedge warbler which has the pitch of its song rising and falling in a jerky way making the song sound very hurried and not at all 'restful'). First image copyright Martien Brand, under a Creative Commons Attribution 2.0 Generic License. Second image copyright Ron Knight, under a Creative Commons Attribution 2.0 Generic License. 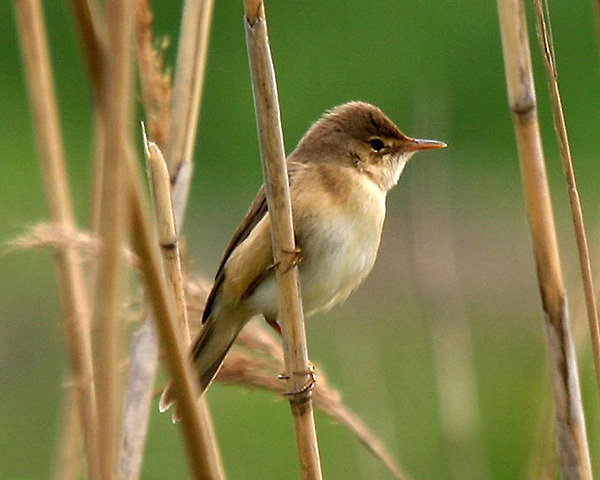 Reed warblers are mainly found in reed beds, usually with a few bushes. They are insectivorous, but will also take a few berries. Reed warblers are migratory, breeding in Europe and temperate western Asia, and wintering in sub-Saharan Africa south to Zambia. 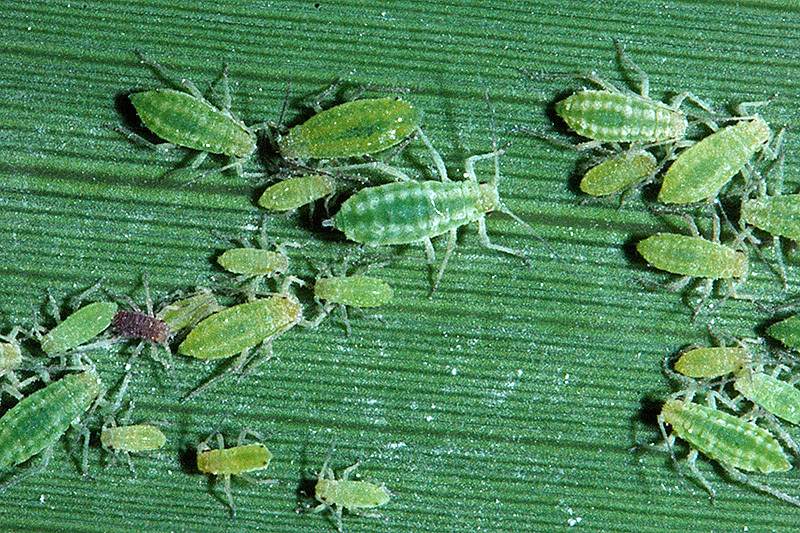 Unlike for most species of birds, there have been many studies on the feeding behaviour and ecology of reed warblers, and it is firmly established that aphids are often an important component of their diet. Just how important is, however, disputed. We have discussed the comparitive work done by Bibby & Green (1981, 1983) and Chernetsov & Manukyan (1998, 1999, 2000) on the feeding ecology of reed warblers and sedge warblers in our account of the sedge warbler. Their conclusions may be summarized thus: Bibby & Green (1981, 1983) concluded that sedge warblers are dependent on the availability of reed (= mealy plum) aphids (Hyalopterus pruni) and other relatively immobile insects like mayflies because they feed mainly by picking prey at rest on a surface. Reed warblers used not only this technique, but also took flying insects by jumping at them as they took off, and were therefore less dependent on immobile insects such as aphids. One picture shows a reed warbler feeding on a colony of reed aphids, and the picture below shows a colony thereof. 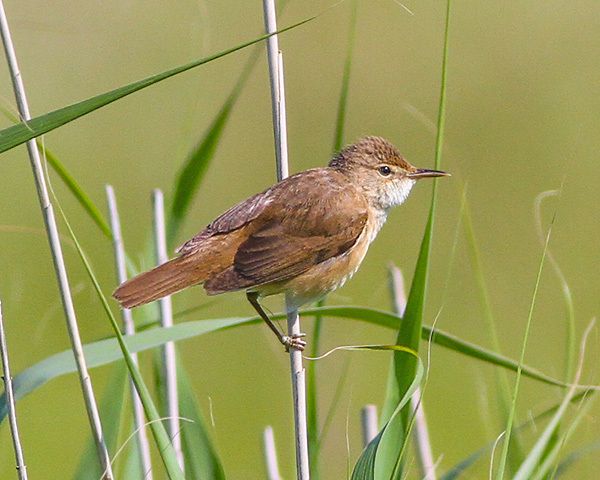 Chernetsov & Manukyan (1998, 1999, 2000) found that in late summer and autumn reed warblers also frequently utilised Hyalopterus pruni and other insects ecologically connected with aphids. But in both seasons the birds used the most common and aggregated prey, and its taxonomic position was of limited if any importance. They argued that Bibby & Green's studies overemphasized the difference between the sedge warbler and reed warbler. Before reaching a conclusion on whether reed aphids are less important for reed warblers than sedge warblers, we review subsequent work on the diet and feeding behaviour of reed warblers. Further support for the apparent preference of reed warblers for aphids comes from the work of Glutz von Blotzheim (2004),(2010). Over 25 years he conducted a very substantive study on bird species feeding on another aphid, Rhopalosiphum padi, on bird cherry (Prunus padus) bushes in autumn. In all he recorded 36 species of birds preying on the aphids, including reed warbler. In 2003 one reed warbler stayed for at least 23 days in the garden just to feed on this aphid. In that autumn it was estimated that just one Reed Warbler had made at least 99,540 presumed prey captures (pecks). Evans (1989) investigated the feeding ecology of reed warblers in Wales. Both adults and juveniles resident at the site during mid-July left the area around mid-August, with the birds tending to decrease in body mass during this period. The mass decline was associated with a decline in the levels of active invertebrates in the site, as sampled by water traps. At the end of August the population consisted almost entirely of juveniles and there was a constant flux of birds into and out of the site. Between the middle of August and the end of September (after which no Reed Warblers were caught), many of the birds increased in mass during their stay and new birds arrived at progessively higher masses. During this period the level of active invertebrates is relatively low and it is suggested that the birds must be foraging more efficiently, or be devoting more of their time to foraging, in order to lay down increased fat deposits. Prey analysis from faeces revealed that on this occasion reed warblers (unlike the sedge warblers) did not feed on reed aphids (Hyalopterus pruni), but fed largely on Diptera, Hymenoptera and Coleoptera. In addition seeds were found to represent a surprisingly high proportion of the number of food items identified. Grim & Honza (1996) examined the composition and variation of food brought to nestlings at two nest sites in reed-beds in the Czech Republic. Food samples were collected when placing neck collars on nestlings in the breeding season of 1994. From 94 food samples were obtained 708 prey items. Diptera (66.5%), Homoptera (12.7%) and Aranea, a genus of orb-weaver spiders, (7.2%) were the predominant food types observed. Idrissi (2004) looked at the diet of reed warblers at two stopover sites in Morocco during the autumn migration. Diet was estimated by means of forced regurgitations of captured individuals during autumn migration at two wetland sites located respectively on the Mediterranean and Atlantic coasts in Morocco. The prey were identified with a predominance of wasps (Hymenoptera) and beetles (Coleoptera) at Kerbacha, and ants including alate forms (Hymenoptera) at Sidi Bou Ghaba. The prey taken differed significantly between the two sites. Birds at Sidi Bou Ghaba had a lower food intake but fed on larger and less mobile prey than at Kerbacha where most diet samples comprised a large number of small flying prey. These between-site differences are assumed to reflect local food availability and may partly explain the different migratory strategies observed. The short stay and high fattening rate of Reed Warblers at Kerbacha can be associated with the high food intake of a few, abundant prey. The longer stopover duration and lower fattening rate at Sidi Bou Ghaba is likely to reflect higher diet diversity and lower feeding rate. This suggests that prey abundance is generally low except for ephemeral patchily distributed food sources such as swarms of flying ants, which are extensively exploited by Reed Warblers whenever available. Of course, when there is an aphid population explosion, this is often followed by a similar explosion in the numbers of predators - which may also be predated by reed and sedge warblers. Grim (2006) in the Czech Republic looked at the food delivered to reed warbler and parasitic common cuckoo (Cuculus canorus) nestlings in reed warbler nests. 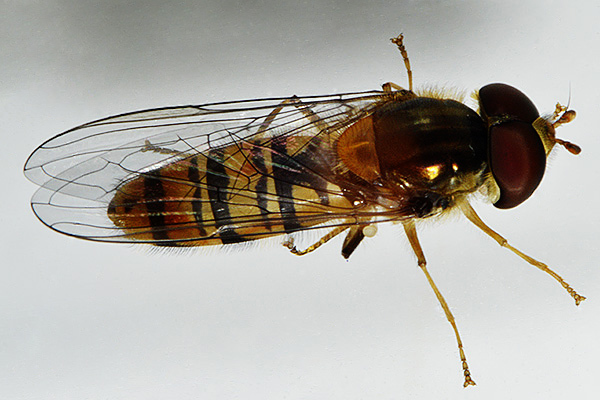 An unusually high diversity of hoverflies was found at 27 species, including several very rare species. Numerically they comprised 3.7% of the prey, with the most common species being Episyrphus balteatus (see pictures of larva and adult below). 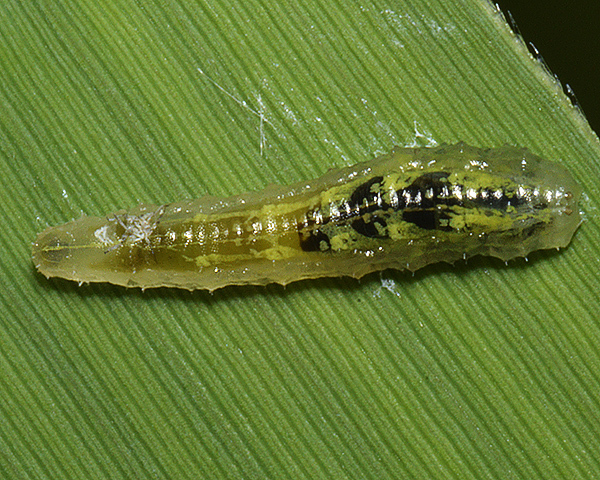 Syrphid larvae and pupae were rare, adults strongly dominating. However, just considering numbers rather than weight seriously underestimates the importance of hoverflies in the diet of reed warblers as hoverflies are one of the largest prey taken by warblers. Interestingly neither specific wasp mimics (e.g. Chrysotoxum verrali) nor bee mimics (e.g. Eristalis species) were avoided by foraging reed warblers, nor did the presence of a parasitic cuckoo chick affect warbler host foraging behaviour with respect to overall dominance of hoverflies in the diet. We may conclude that, much like the sedge warbler, the reed warbler favours prey with a strongly aggregated distribution, especially prior to its migration. The reed aphid on its summer host - reeds - fits the bill admirably, but so do the insect predators feeding on the aphids and any other insect species that aggregate in large numbers such as flying ants and mayflies. Neither the reed warbler nor the sedge warbler can be regarded as specific aphid predators, but aphids frequently make up an important part of their summer diet. What impact the combined predation of the two warbler species have on the reed aphid (and predator) populations is unknown. Any regulatory effect upon the summer population is improbable given the prodigious reproductive power of aphids, but predation of the smaller numbers of males and gynoparae in September/October before they migrate back to plum may affect future populations. For bird identification we have used BTO Bird identification videos for the key characteristics, together with the latest Wikipedia account for each species. For aphids we have made provisional identifications from photos of living specimens, along with host plant identity using the keys and species accounts of Blackman & Eastop (1994) and Blackman & Eastop (2006) supplemented with Blackman (1974), Stroyan (1977), Stroyan (1984), Blackman & Eastop (1984), Heie (1980-1995), Dixon & Thieme (2007) and Blackman (2010). We fully acknowledge these authors as the source for the (summarized) taxonomic information we have presented. Any errors in identification or information are ours alone, and we would be very grateful for any corrections. For assistance on the terms used for aphid morphology we suggest the figure provided by Blackman & Eastop (2006).